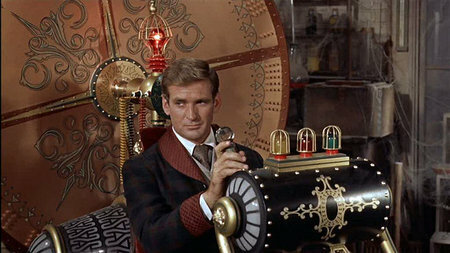 As a young boy first getting interested in older movies, I always enjoyed the film The Time Machine. The Morlocks always scared the heck out of me - and years later they still do. The Time Machine also was one of the first movies I bought on DVD in the late 1990s. Even though I have it in my collection, I watched the film again when Turner Classic Movies just recently aired it. 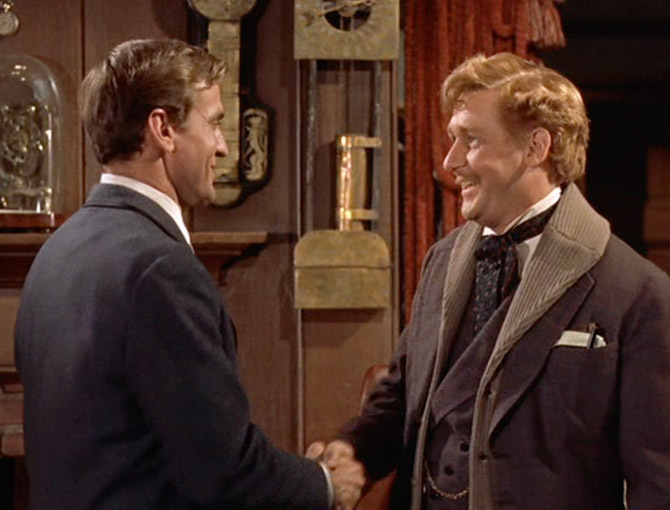 On January 5, 1900, four friends arrive for a dinner in a town in the south of England, but their host, H. George Wells (Rod Taylor), is absent. As requested, they begin without him, but then George staggers in, exhausted and disheveled. He begins to recount his adventures since they last met on New Year's Eve, 1899. 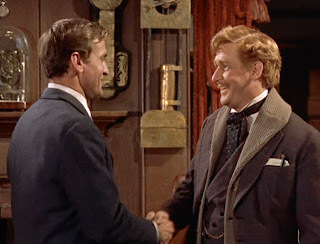 A week earlier, George discusses time as "the fourth dimension" with friends, among them David Filby (Alan Young) and Dr Philip Hillyer (Sebastian Cabot). He shows them a tiny machine that he claims can travel in time, stating that a larger version can carry a man "into the past or the future". When activated, the device blurs, then disappears. Most of his friends dismiss it as a trick; Filby, on the other hand, warns George that if it is not a trick, it is not for them "to tempt the laws of Providence." They agree to meet again next Friday. George heads to his laboratory and sits in his full-scale model. He pushes the lever forward and watches time pass at an accelerated rate. To his amusement, he observes the changing of women's fashions on a mannequin in the window of a shop across the street. He stops at September 13, 1917 when his house is boarded up. He breaks some boards away and walks inside, where he mistakes a man in uniform for David. It turns out to be David's son James, who informs George that his father had "died in the war", and that they have been at war with Germany since 1914. He tells him that an Inventor lived across the road who disappeared around the turn of the century, and that his father refused to liquidate it, feeling sure the inventor would return some day. George then travels to June 19, 1940, into the midst of "a new war", which he briefly stops in as his machine is buffeted from side to side, in which course his house is hit and destroyed while he is travelling. George's next stop is August 18, 1966, in a metropolis featuring skyscrapers and an elevated monorail. There is a plaque to his house at the site. However, he is puzzled to see people hurrying into a fallout shelter amid the blare of air raid sirens. An older, grey-haired James Filby tells him to get into the shelter, but seems to remember him, before warning him that "the mushrooms will be sprouting." James spots an atomic satellite zeroing in and flees into the shelter. An explosion turns the sky red and lava floods down the street, after the nuclear explosion causes a volcano to erupt (nature is reacting to man's abuse of technology). Modern civilization is destroyed in a nuclear holocaust. George restarts the machine just in time to avoid being incinerated, but the lava covers the machine, then cools and hardens, forcing George to travel far into the future until it erodes away. He stops the machine on October 12, 802,701, next to a low building with a large sphinx on top. George explores the seemingly idyllic pastoral paradise and finds a great hall. He feels alone and wonders whether humanity still exists, until he hears voices, and spots young adults by a river. A woman is drowning, but the others are indifferent. George rescues her, but is surprised by her lack of gratitude or other emotion. She calls herself Weena (Yvette Mimieux) and her people the Eloi. As night falls, and the Eloi head into a large building where there is food unlike that in his time, George is surprised to find out that the Eloi have no government, no laws, and no civilization to speak of. Curious, he asks to see their books, but when he finds the books all covered in dust and so rotted by mold that they crumble at his touch, he becomes outraged. He returns to where he had left his time machine, but it has been dragged into the sphinx-building, behind locked metal doors. Weena follows George and insists they go back, for fear of "Morlocks" at night. A bizarre creature covered with long coarse white hair jumps out of the bushes, seizes Weena to prevent her from crying out, and tries to drag her off, but George rescues Weena and wards the beast off with fire. Dazed and shaken, Weena informs him that the hideous creature was one of the Morlocks. The next day, Weena shows George what appear to be domed well-like air-shafts in the ground. She then takes him to an ancient museum, where the "talking rings" (flat shiny metal rings that can play a recorded message when they are stood vertically on edge and spun like a top) tell of a centuries-long nuclear war/holocaust. It ended after 326 years; by then the atmosphere had become too polluted for humanity to easily survive. 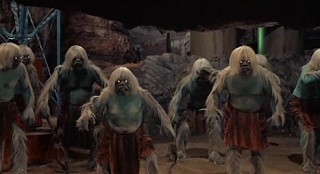 One group of survivors remained underground in the shelters and evolved into the Morlocks, while the other group, which became the Eloi, returned to the surface. George starts climbing down a shaft, but turns back when a siren begins blaring (it is the same air-raid sirens heard in the far past during the nuclear war) from atop the sphinx-building. Weena and the rest of the Eloi walk with a slow emotionless trance-like stride across the land like herded livestock (George remarks that the Eloi are "nothing but fatted cattle to the Morlocks"), and complacently file through the now-open doors of the building, conditioned to walk into the doors, drawn in by the siren. When the siren stops, the doors close, trapping Weena and others inside. The Eloi tell George that the sirens mean "all clear", but they have no idea what it means (it originally meant shelter from a nuclear raid; but now used to lure the Eloi to the Morlocks). To rescue Weena, George climbs down a shaft and enters the subterranean caverns. 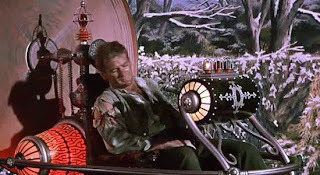 In one chamber, he finds human bones and realizes that the Morlocks eat the Eloi. Discovering that the Morlocks are sensitive to light, George uses matches to keep them at bay, eventually fashioning a makeshift torch from a thick wooden stick and some tufts of shedded Morlock hair. A Morlock knocks it away, and a Morlock starts overpowering George, but one of the Eloi summons up the courage to beat the Morlock to death, thus showing that the Eloi are not yet entirely docile. They come to their senses and begin the reawakening that George spoke about to Weena the night before in front of the sphinx. George tells the Eloi to start setting fire to material in the cave, driving off the Morlocks, then leads the Eloi up the shafts to safety. Under his direction, they drop dry dead tree branches into the shafts to feed the fire. There is a series of explosions as each of the domed wells spurts fire one by one and sinks into the ground, and then the entire area caves in, crushing and suffocating most of the Morlocks below. The next morning, George finds the sphinx-building in charred ruins and the doors to the building open again, with his time machine sitting just inside the entrance. He goes to retrieve his machine, but the doors close behind him and he is attacked by the remaining Morlocks. He knocks one against the wall, killing it. In the faint light of the still-smouldering fires, George manages to activate the machine and escape, first a little farther into the future, accidentally, which he realises when he sees the dead Morlock becoming a skeleton, then back to January 5, 1900. George's friends scoff at his story and leave; only Filby believes him. He shows a flower from the future, which Filby says could not have bloomed in the winter. 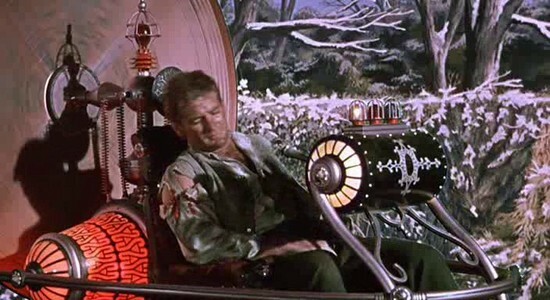 Filby turns back and hears the machine being activated, but by the time he reaches the laboratory, George is already leaving on his time machine. Filby tries to break the door down but is too late to prevent his friend from escaping back into the future. He realises George moved the machine inside, so he can appear outside the Sphinx where Weena will be. The housekeeper, Mrs. Watchett (Doris Lloyd), notes that George took three books with him, probably to help the Eloi rebuild their civilization. Filby asks Mrs. Watchett which three books she would have taken to restart a civilization, and then he leaves with the hope (which is maintained by his son, as previously seen) that George may yet return, as "he has all the time in the world."